The infamous, malevolent Bell Witch of Tennessee. Also: DJ and costume contest! Posted in Author Appearances, authors, Books, Ghosts, Historical Fiction, Paranormal, Storytelling and tagged author appearances, Bell Witch, book signings, books, ghosts, historical fiction, legends, paperbacks, paranormal, storytelling on July 31, 2013 by Pat Fitzhugh. Tune in for an hour of fun discussion about the Bell Witch, the paranormal, and my writing, on “The Fringe” radio show at KTKK AM 630 (K-TALK) in South Jordan, Utah. 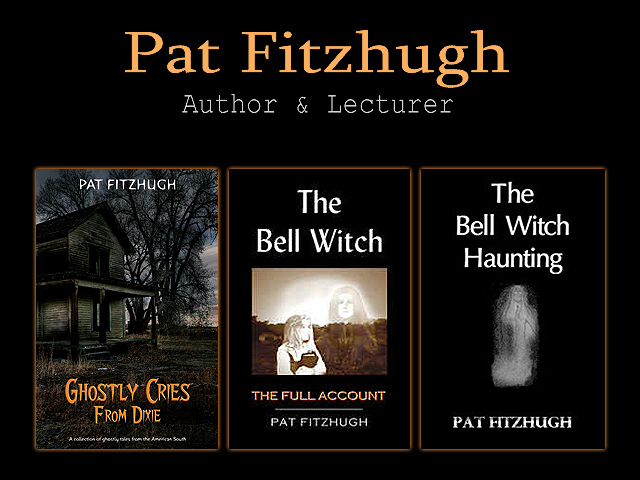 Posted in Author Appearances, Author Interviews, Books and tagged author appearances, author interviews, Bell Witch, books, ghosts, historical fiction, legends, paranormal, Pat Fitzhugh on June 14, 2013 by Pat Fitzhugh. Pros: 1) Great interviewer. 2) Great questions. 3) Huge, awesome listening audience! Con: Due to my chronic allergies, I sounded like a skinned mouse in a blender that was on steroids; and, whenever I cleared my throat, I sounded like two whales making out to Barry White. Disturbing, I know. Warning given. If you’d still like to listen, or even download the audio file, please click here. Thanks! Author Pat Fitzhugh joins host Alex Matsuo of Paranormal Insider Radio to discuss the infamous “Bell Witch” legend of Tennessee. Known as “America’s greatest ghost story,” the legend centers on a pioneer family that endured four years of mayhem and terror at the hands of a sinister, demon-like entity named, “Kate.” She beat the Bell children mercilessly; she argued with the clergy; she told of people’s pasts and predicted their futures; she spoke in multiple human voices, sometimes even in tongues; and she inflicted a horrendous disease upon a man, which led to his slow and grueling demise. And now, almost two hundred years later, “Kate” still remains a mystery. Theories abound, but the truth eludes us. Kate’s lingering presence is still sometimes felt in northwestern Robertson County. Pleasant dreams. The Bell Witch is the subject of the 2006 motion picture, “An American Haunting,” starring Sissy Spacek and Donald Sutherland (and in which I appear, also), and the 2003 movie, “The Bell Witch Haunting,” by Willing Hearts Productions. The Bell Witch: The Full Account was released in 2000, and updated in 2003 and 2009. The book’s Thirteenth Anniversary edition, which includes new information and a complete rewrite of the original book, is due October 13, 2013. For more information, including news and progress reports, make sure to “Like” the book’s fan page on Facebook. Paranormal Insider Radio is an outlet of the Paranormal Research Society (PRS), from A&E’s “Paranormal State” TV show. The interview will last two hours. Listen live at: http://www.blogtalkradio.com/paranormalinsider/2013/04/23/americas-greatest-ghost-story-the-bell-witch Also, I’ll be taking questions by phone during the show. The listener call-in line will be: (347) 324-5969. I’ve received several private messages with questions about the rewrite/13th Anniversary edition of “The Bell Witch: The Full Account.” That’s great! I intend to publish a FAQ about the rewrite in the coming days. The “Rewrite FAQ,” as well as progress reports and excerpts, will be posted to the book’s existing Facebook page. The new edition will not have a dedicated page; it will use the existing Bell Witch page. For those with questions about the new book, or who would like progress reports and excerpts, please make sure to add the following page to your Facebook “Likes.” Thanks! Posted in book promotion, Books, e-books, Ghosts, Historical Fiction, Paranormal, Storytelling, Writing and tagged amwriting, Bell Witch, books, eBooks, Forthcoming titles, ghosts, paranormal, witches, Writing on April 10, 2013 by Pat Fitzhugh. I’ve been busy typing away on the update and complete rewrite of The Bell Witch: The Full Account, scheduled for release on October 13, 2013. The book’s first edition debuted on Friday, October 13, 2000. Yes, Friday the thirteenth of October, in the year 2000. The 2013 update, which is a full rewrite available in both paperback and eBook formats, coincides with the book’s thirteenth anniversary. There’s just something about that number–thirteen. Reduced the page count from 406 to 348! Removed three entire sections (not reflected in revised page count). Added 24 new pieces of new information about the case. The copy and developmental editing will continue over the summer. New covers, both front and back, will also be added. The promotional campaign will begin in May. Also this year, I have two more books to finish and a busy lecture/signing schedule. Please send prayers and coffee. Posted in authors, Editing, Paranormal, Writing and tagged amwriting, authors, Bell Witch, editing, Forthcoming titles, ghosts, hauntings, paranormal, Tennessee, witches, Writing on April 4, 2013 by Pat Fitzhugh. To celebrate the book’s thirteenth anniversary, The Bell Witch: The Full Account will be offered as an eBook for the Kindle, Nook, and iReader, beginning October 13th. But that’s not all. The Bell Witch: The Full Account, which reveals many previously unknown facts surrounding the infamous case, raised the bar for Bell Witch research and caused two previously published Bell Witch books to be rewritten after its publication. And, nearly every Bell Witch book, video, and article produced since “The Full Account” has drawn extensively from its research notes and appendices, sans attribution. Over its life, “The Full Account” has attracted two motion picture options and has twice appeared on the State of Tennessee’s Suggested Teen Summer Reading List. The Bell Witch rewrite and eBook conversion will be Fitzhugh’s main focus over the coming months. The sequel to Ghostly Cries From Dixie is still planned, but its release could fall in early 2014. From Turkey Creek – A Memoir, Fitzhugh’s childhood memoir, is now in final edit and should released in time for the holidays. To keep up with the Bell Witch eBook project’s progress and other news pertaining to The Bell Witch: The Full Account, please join the book’s official fan page on Facebook. Posted in Book Publishing, e-books and tagged Bell Witch, book publishing, e-books, Forthcoming titles, ghosts, hauntings, indie publishing, paranormal, self-publishing, spooky, witches on March 17, 2013 by Pat Fitzhugh. Hailed by many as America’s greatest ghost story, the legend centers on an early pioneer family who endured fours of mayhem and terror at the hands of a sinister entity called, “Kate.” After nearly 200 years, the mystery still hasn’t been solved, and Kate’s lingering presence is still felt near the old Bell farm. The interview’s official page is: http://www.blogtalkradio.com/paranormalinsider/2013/04/23/americas-greatest-ghost-story-the-bell-witch You can listen live at this page. Posted in Author Appearances, Ghosts, Paranormal and tagged author appearances, Bell Witch, ghost stories, paranormal on March 9, 2013 by Pat Fitzhugh. Join me on “Crossing the Void” Paranormal Radio for a two-hour discussion about my writing, the Bell Witch legend, and other creepy tales. Posted in Author Appearances, book promotion and tagged author appearances, authors, Bell Witch, ghost stories, haunted, paranormal, radio interviews on January 22, 2013 by Pat Fitzhugh. I can’t begin to thank my readers enough for their support in making the Kindle edition of Ghostly Cries From Dixie a huge success. Released only a month ago, the e-Book’s growing popularity exceeds my wildest expectations! If you prefer paperbacks and haven’t grabbed a copy yet, a paperback edition of Ghostly Cries From Dixie is also available. Again, thank you, my dear readers, for your unwavering support; you are why I write. Posted in authors, Books, kindle and tagged Bell Witch, books, e-books, eBooks, Ghostly Cries From Dixie, ghosts, good books, Kindle, paranormal, Pat Fitzhugh, southern culture on December 31, 2012 by Pat Fitzhugh.